On arrival you will enter a small corridor with ladies/gents and disabled toilets leading to the reception (Pay Area) where you can choose all the normal methods of payment and gift aid your entry if you wish. If you do suffer from a disability we have made every effort to make sure you see as much as possible and can provide a wheel chair if you wish. Passing through the well stocked model and book shop you will enter the Sir Frank Whittle area where you can learn and absorb the history of the jet engine and see and feel examples of one of his early designs. There is a lot to take in in this area and you may wish to return to it later during your visit to try and absorb some more detail. On leaving this area you can choose to walk around inside the hanger and sit in a meteor cockpit for a selfie or stick your nose in to a Canberra cockpit and hear a typical start up and sortie in progress. You could wander upstairs in to our gallery display area and see artifacts from WW1,WW2 to a full on Saphire jet engine. a maze of corridors to explore all packed with exhibits,leaving you with a wish that you had allocated more time to absorb all the detail. On climbing down the stairs you could via the display cabinets absorb the history of the RAF and its Coventry and Warwickshire associations look close up on some jet/rocket/piston engines. Too much to mention in one paragraph as you can imagine, but you can get close to the British designed and flown Leopard business jet which sadly never went in to production but was the ultimate in luxury business jet travel. From the hanger, venture outside to the Vulcan, Yes full size not just a cockpit, and you will be met by a guide who will show you in to the cockpit of this classic V bomber and explain all of the interior and exterior details. Just to be clear the pilots seats are not open to visitors as they are very cramped and contain very fragile safety equipment but the rear seats are there for you to occupy. This aircraft is just as it flew in to us and has not been got at in any way except for a dab of paint now and again so you can truly relive the lives of those crews that flew in the cold war in the genuine article without it costing you an extra penny. Saying that if you wish to donate to its upkeep for future generations it is left entirely up to you. From the Vulcan, our next largest aircraft is the Locally built Armstrong Whitworth Argosy Freighter. You can climb in the freght hold and move forward in to the cockpit under the supervision of a guide, who will explain the history of the aircraft and let you sit in the pilots seats for that inevitable selfie. On leaving the Argosy you are free to wander around the aircraft on display outside (please dont cross the barriers) and you will be able to get very close believe me. The list of aircraft on show is elswhere on this website so make a beeline if you want to your favourite aircraft. Occasionally on cockpit open days we have other aircraft open so keep an eye on the website and if you have a special reason for your visit(like you flew the type) please give us a ring first to check availability of guides and technical assistance to open the aircraft. We try to be accomodating but we make no promises. At the bottom of the site is our Victor Nose section the Vickers Viscount aircraft and our Robin Hanger. Inside the Hanger you will see restoration in progress. On the walk back up the site you will pass more aircraft of a bygone era including two Lightnings and some American cold war aircraft. Photography for personal use is allowed, but if you are in the publishing business other rules do apply so please ask at reception to prevent any misunderstanding. I hope you have recieved a taste of whats in store for you during your visit and please feel free to read previous news reports giving a more detailed account of some of the restorations. One last thing I might add is that we do talk to the public (a little too long and too much some would say) and are only to pleased that you are interested in what the museum is trying to achieve,so please do not be afraid to ask for information because if we dont know we probably know where to point you to someone who does. Please allow yourself enough time to see the museum properly and to browse the model shop when you have finished your visit all to often we hear the phrase "I should have allowed more time for my visit. Doors open promptly at 10AM we close at 5PM. You will be relieved to hear that we are fully equipped for Teas/Coffee light snacks etc in our excellent tea room (menu on display) for your mid visit refreshment needs. Alternately we have no objection to you bringing a family picnic and eating it outside (check the forecast) on one of our many picnic benches. Please feel free to ring the museum and ask about special needs and any forthcoming events. We hope this has been of some use to you in helping you in your wise decision to visit the museum as soon as possible. 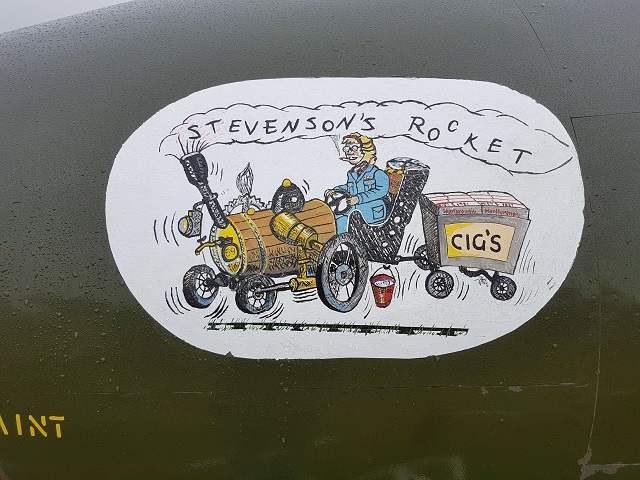 Ok so what is this nose art on our Canberra PR3 all about "Was it even allowed in the cold war?"